I have mentioned a few times on my facebook something called "fredagsmys". This is basically the Swedish version of TGIF. I looooove fredagsmys. It's when you make a good dinner, sit in front of the TV and watch good Friday night TV such as "Så ska det låta", "Talang" "Skavlan" and some sort of movie ususally at 10pm. The first is a singing show. They get famous people to come compete with a "piano man" and they have different categories, such as the intro to a song, and the first team to identify it has to sing the song. It's a lot of fun! Talang is the Swedish version if America's got talent and it usually makes me mad because they say no to a lot of really talented people! Skavlan is a talk show with a Norweigien man, Fredrik Skavlan, who is doing a Swedish talk show. I love this because the people he usually has an American or English speaking guest and the guests all stay so they can all talk and there is always a singing performance. He surprisingly has a lot of really famous Americans on his show! 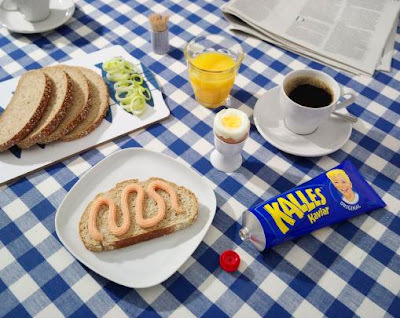 The Swedish thing of the day is Swedish breakfast. As I was grocery shopping today, I was thinking about what Fredrik and I needed for breakfast the next few mornings and it hit me how my grocery list has changed. I was thinking about eggs for boiled eggs, caviar and cheese! What's wrong with me! The Swedish word of the day is "frukost" which means "breakfast". You can buy Kalles at Au Marche in Lawrence. As well as a few other Swedish goodies. A glass of wine or a beer and some munchies and we are ready to sit on the patio or with our feet up and watch a movie or read. There will be time enough on the weekend for yard work and other chores! Chillin' with your honey is the best! I love this post. It has been fun to watch your transformation from being so new to everything to being accustomed to the things that really are so very different from your Kansas life. What an awesome life experience you are having! I love it! How beautiful your table looks too. I think we're going to be able to "fill" Fredrik's Swedish hungers with some of his favorites. Can't wait for Friday now! Love you Mom.